/ 8 ways Domo delivers more bang for your brand. Over and over, we hear the same story from our customers: Domo is making it easier to do their jobs well, and making their lives more balanced as a result. 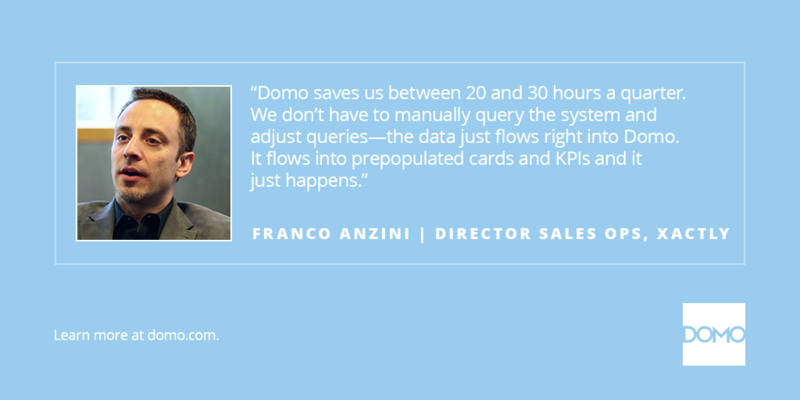 It’s not that Domo takes all of the hard work out of running a business—but it does help people do more with the data they already have. It’s that direct customer feedback that drove the message of our latest campaign: “Finally. A better life.” Our customers are investing in Domo not only because of what it does, but because of what it enables them to do. Stance CEO Jeff Kearl can now focus only on what matter most, spending more time with his son. Melissa Davis at Ogio now knows her team has the data they need, so she can finally take a day off. Tabitha Manross of Goodwill saves 20 hours of time-consuming manual reporting per week, so she can focus on the big picture. Sage’s Bao Nguyen now has all the data he needs at his fingertips, so he can spend more time cycling up and down the coast. How does Domo do these things for its customers? 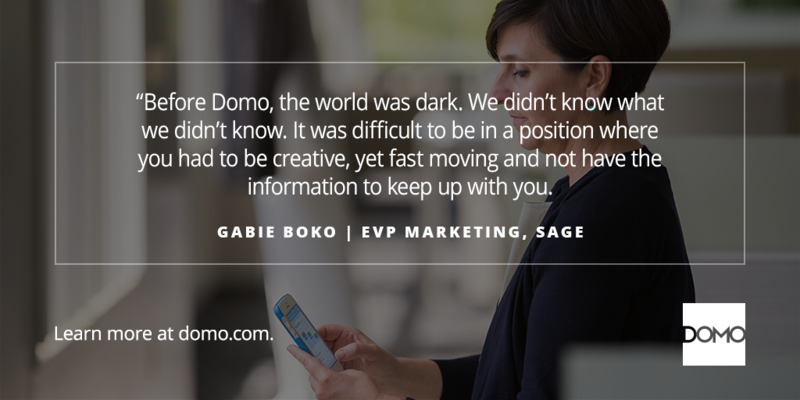 Here are 8 ways Domo transformed their businesses. The challenge: Businesses are under higher demands than ever before. But reporting is too manual and—let’s be honest—your Excel chart makes little sense to anyone outside of your department. The better life: Domo offers pre-built best practices that answer the most pressing questions for your business, so you can visualize your information in a few clicks. The challenge: Meetings take up too much of your day, and much of that time is wasted talking about outdated data and reports. The better life: DomoBuzz gives you the ability to have conversations with your team right where your data lives, so you can ask questions, get answers, loop in key stakeholders, and make better decisions, faster. The result? You’re more productive, and better yet, you’re home in time for dinner. The challenge: Collaboration and communication between teams is virtually nonexistent, and teams are lost as a result. 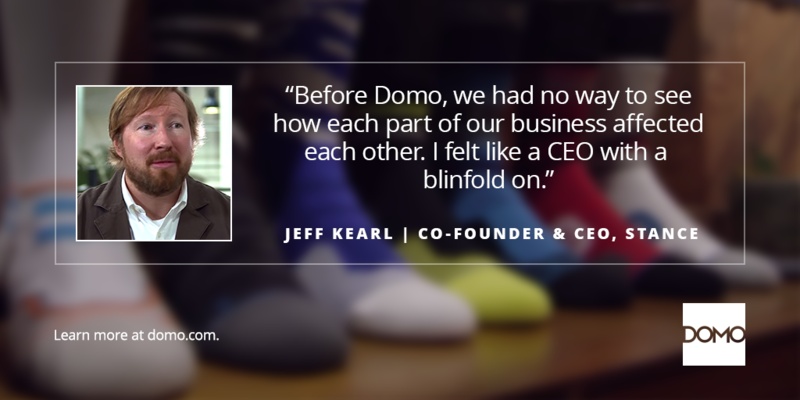 The better life: Domo makes business collaboration simple. Ask questions, get answers and take action—right where your data lives. The challenge: Even though analytics tools are available teams aren’t sharing information or working toward a common set of KPIs. The better life: Domo Profiles delivers the information teams need to make thoughtful requests of one another, and tell better business stories with data. Better decisions are made, faster. The challenge: You spend months assembling datasets that are outdated before they’re ever used. The better life: Domo delivers the information you need in real time, instead of lag time. You get a comprehensive business picture of what’s happening all across your organization, as soon as you want it. The challenge: You see your team’s data. Other teams? Not so much. So you’re asking for weekly reports via email, or checking in with phone calls and endless meetings. The better life: Domo brings all your people and data together in one place, making it easy to see your data in context and collaborate around it in real time. The challenge: Your data lives here, there, and everywhere. The better life: Domo has developed hundreds of pre-built connectors that enable you to pull business data from anywhere, so you can always make the best decisions, with the best available data. The challenge: You have a bunch of information in front of you, but insights are trapped in rows and columns. The better life: Domo gives you the freedom to visualize your data the way you want, so you can tell the stories that will move your business forward. In one simple, easy-to-use platform, you’ll have your entire company making smarter, data-driven decisions. It’s a better life for you, and a solution that will transform the course of your company.